By choosing colours from cool or pale palettes you can easily make your room feel as airy and large as possible. This is because the light is reflected, increasing the sensation of spaciousness. White is always a winner, although sometimes it can be a pain to clean and often seem a little clinical. Therefore if you're looking for something a little more hip try incorporating some pastels in here or there. Finally ensure you avoid any stark colour contrasts throughout the room. The more you can cast your eye around the room uninterrupted, the larger you'll perceive the room to be. If you have a smaller kitchen you're going to want to make the most of every inch of counter space. Therefore in order to maximise your available space we recommend installing some high shelving or cupboards. This way you can tuck away ample amounts of storage, and also avoid cluttering up the counters with extra appliances and tools. Glass fronted cabinets and doors can work wonders for small kitchens, adding depth and visual dimension. Light is always your best friend in any home, but never more so than in small spaces. 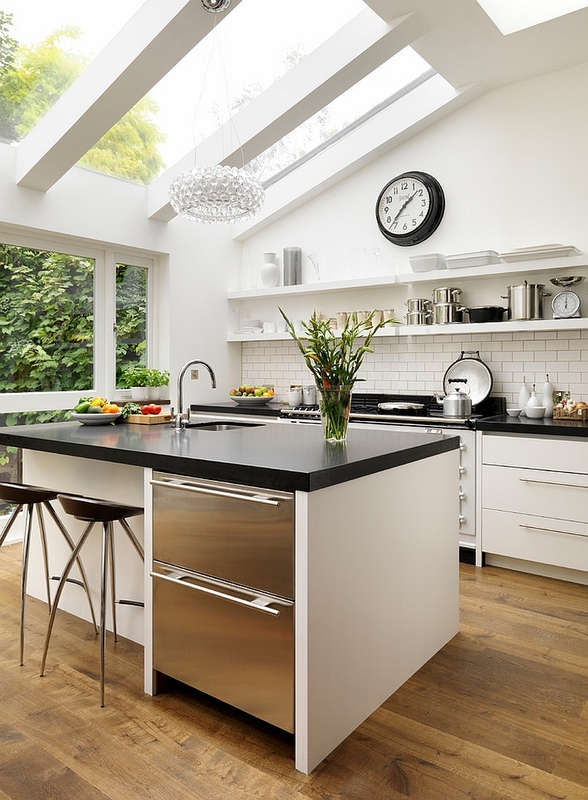 If you utilise it correctly you can play tricks on the eyes, helping you kitchen to seem more roomy and airy. Therefore in order to let in more light you might want to consider raising your roof height and installing in a skylight. Next recessed LED lighting wont take up any ceiling space, but will still light the room sufficiently. Finally choose to incorporate mirrored or reflective surfaces to reflect light and extend the room. This can be done via the backsplash, or simply by hanging a mirror somewhere around the space. Surprisingly enough some funky flooring can help the room seem larger. 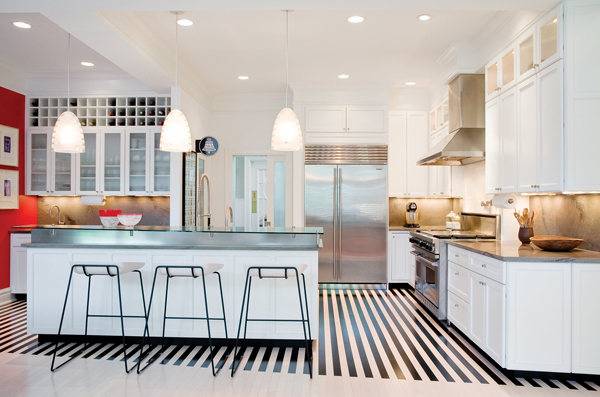 Diagonal and stripe based patterns lead the eye down a longer path, hence giving the effect of a lengthier room. Conversely noisy, or boxy patterns should be avoided as they can be distracting and provoke a crowded feeling. If you choose to knock down some of the walls enclosing your kitchen you could then opt for a open floor plan style living area. This allows you to increase the overall space you have available for use, and additionally increases the sense of spaciousness and flow around your home. If this is too much for your budget or simply not feasible you could alternatively opt for some glass doors.